Armação dos Búzios is about 105 miles or 170 kilometers northeast of Rio de Janeiro. Armação can refer to a small armory, or to a frame erected for the processing of whales. You can call it Buzios. Its history reads somewhat like an improbable beach blanket movie script, but it has the advantage of being true. In the early 1900s, the sleepy little fishing village with at least two dozen beautiful beaches became a favored getaway for Carioca high society—the moneyed people of Rio. And then, in 1964, the rest of the world caught on. In that year, a not-very camera-shy French actress, famous for her face, figure, and credited with popularizing the bikini swimsuit—as if that needed any assistance—came to town and almost everything changed. I’m speaking, of course, of Brigitte Bardot, who made a vacation trip to Rio with her Brazilian boyfriend of the time. When they arrived in Rio, they were hounded by paparazzi. So they broke away to a quieter place: Buzios. At the time, the small town had no electricity and life there was very simple. And Bardot liked it very much. Today there are streets, a movie theater, shops, and other places named after Bardot. 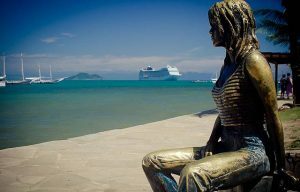 There’s even a bronze statue of her along the beach—one of the few, if not the only one in the world that shows a woman in blue jeans and a tank top. Today, Buzios is home to about 24,000 people, although that number can swell greatly with visitors, mostly from Brazil and Argentina. It has a string of beautiful beaches on an 8-kilometer or 5-mile-long peninsula. And some of the sun worshipers wear (if that is the word) beach apparel that would make Bardot blush. All photos and text Copyright 2017 by Corey Sandler, all rights reserved.